Right after wrapping up the first day of the tournament, Kiri and friends had organized dinner and drinks in the center of Luxembourg: so the following morning we weren’t exactly fresh! It certainly didn’t help that our opponents were some of the best players in Europe: TG Play is the team of Frederick and friends, bringing together three of Germany’s best players along with two of team Switzerland’s best players! 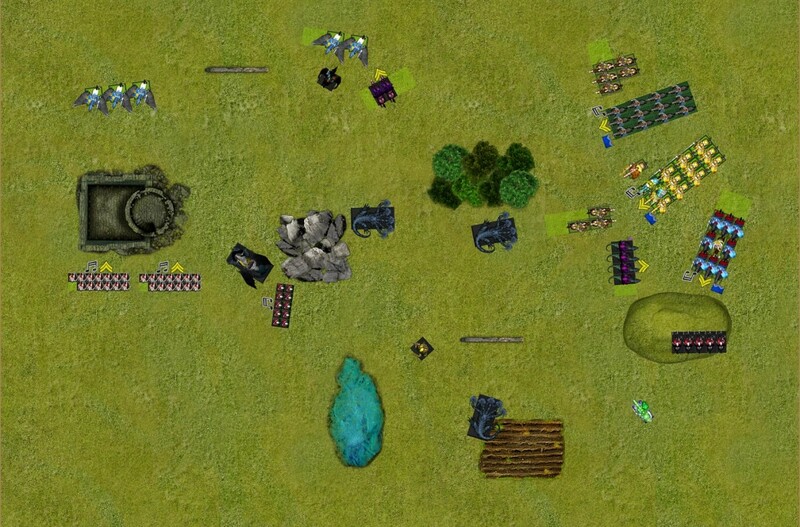 As you may imagine, our predictions for that round were quite pessimistic as all the usual suspects were present: full shooting/magic Vermin Swarm, an EoS gunline, full construct UD, Frederick’s 16-unit WDG MSU army and, finally, Kingdom of Equitaine led by the usual Might Duke. It was the latter that I’d have to face, in a round where the secondary objective was Breakthrough! 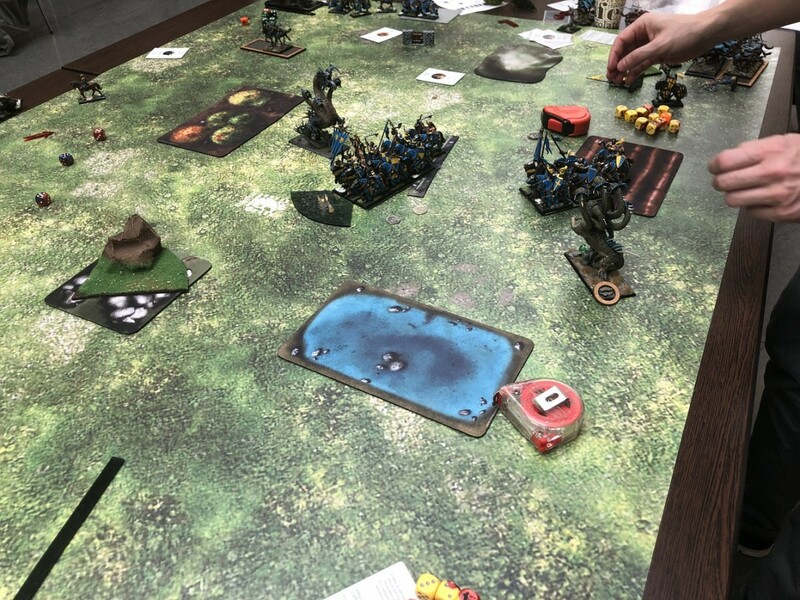 The deployment we got was Encircle, which is always tricky against KoE: luckily, I won the roll for sides and elected to give the big flanks to the knights, kind of forcing them to pick a side instead of plonking everything right in the middle of the board. Spell selection was the usual for me (Ice and Fire/Crippling Fatigue and Breath of Corruption/Grave Calls) while my opponent got Evocation for his Crown of the Wizard King (= Spectral Blades) and a mix of buffs and damage spells from Divination (Scrying/Know thy Enemy/Fate’s Judgment/Unerring Strike). 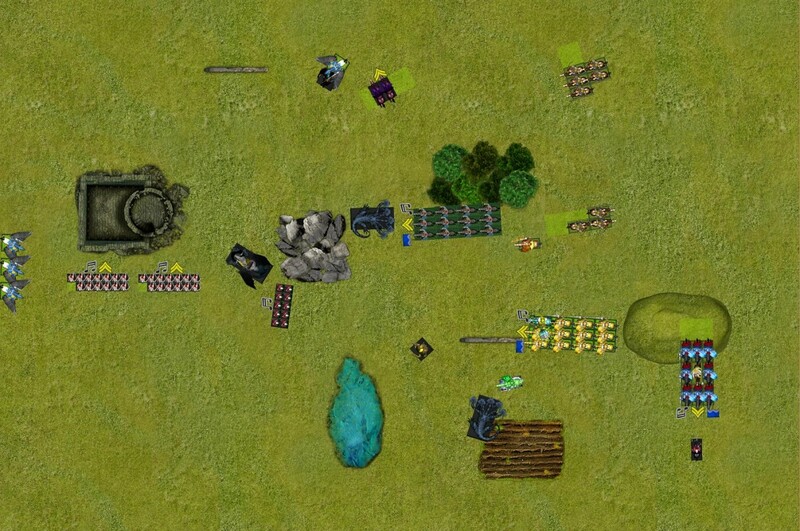 I think that the most challenging part of this battle was deployment: my DE army is designed to rush the enemy and break through the lines with superior force concentration, before the adversary’s support elements can move into position to help out. But that’s exactly what KoE excel at doing, too! The main difference was that the knights had enough staying power to ensure that my Krakens wouldn’t be able to punch through before the support (Read: Might Duke and Green Knight) could come to the lances’ aid. The knights had four units that could rapidly redeploy, and placed them one after the other near the middle, so as to avoid giving away too much information. I replied with my fast support, with the same plan in mind. At that point my opponent dropped all 3 of his lances to my right flank and elected to force me to play first. 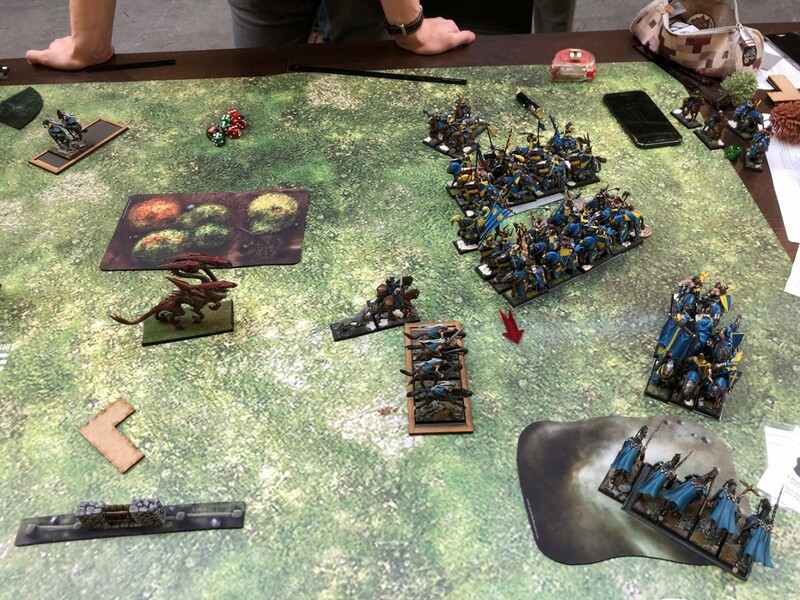 And that’s where things got complicated for me: normally, getting the first turn with an army as fast as mine is a boon since I’m able to close the distance and can assure that my chaff won’t be killed before they redirect. But here I wasn’t so sure that I wanted to directly confront the KoE, since it would give them a lot of time to reposition and get my softer units if they won the initial fight. On the flipside, giving the first turn to cavalry that can move 16” means risking getting charged on turn 2, which can be worse. So the scoring units as far away from the action as possible, the Manticore BSB nearby to keep the Pegasus knights honest, then my redirectors and heavy hitters in the center to try to prevent the knights from relocating towards the scorers. The knights prayed, meaning that the first turn would depend on a dice roll. I won the roll, and forced the KoE to play first! The knights didn’t take the fast cavalry baits that I had set up for them, opting instead to push up my right flank, and keeping the Yeomen close to the general and far from my units, to my disappointment: as long as the fast cavalry was in range to redirect my kraken, I would have a hard time committing. The Green Knight appeared and moved behind the hill to the right. In magic I stopped the Unerring Strike against my fast cavalry, and the Fate’s Judgment killed three yema acolytes (not shown in image). With the lances positioned in a way to aggressively push forward on the following turn, I had to at least pretend to want to engage them! 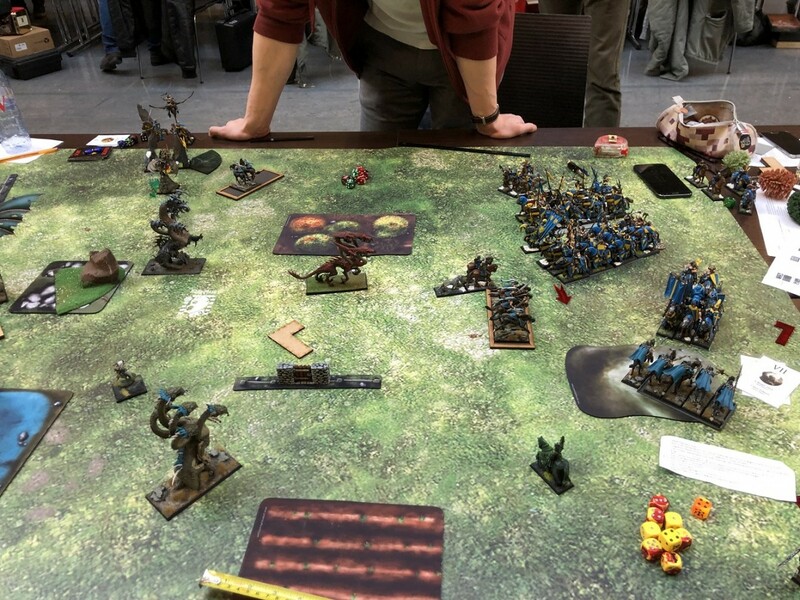 So the closest Dark Raiders moved up to block the Questing Knights and the Aspirants, a medusa stepped in front of the Realm Knights and the heavy hitters advanced towards the lances, cautious not to give any overruns to the KoE. My Prince moved up in a position from where he could either charge one of the lances and pin it to place, or chase the fast cavalry away. To the left, the Blades of Nabh started their long slog towards the enemy deployment zone, only giving the Pegasus Knights long charges. 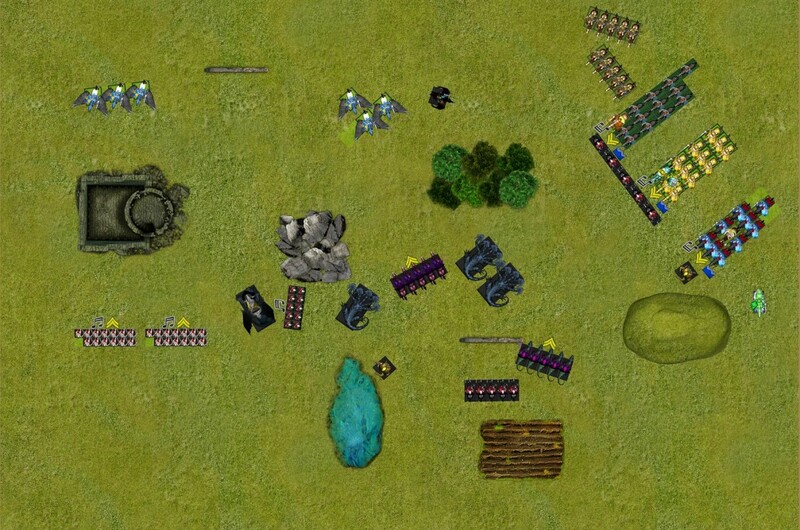 The Manticore BSB protected them from any kind of aggressive advance moves from the flying knights. In the magic phase was a Breath of Corruption got dispelled. 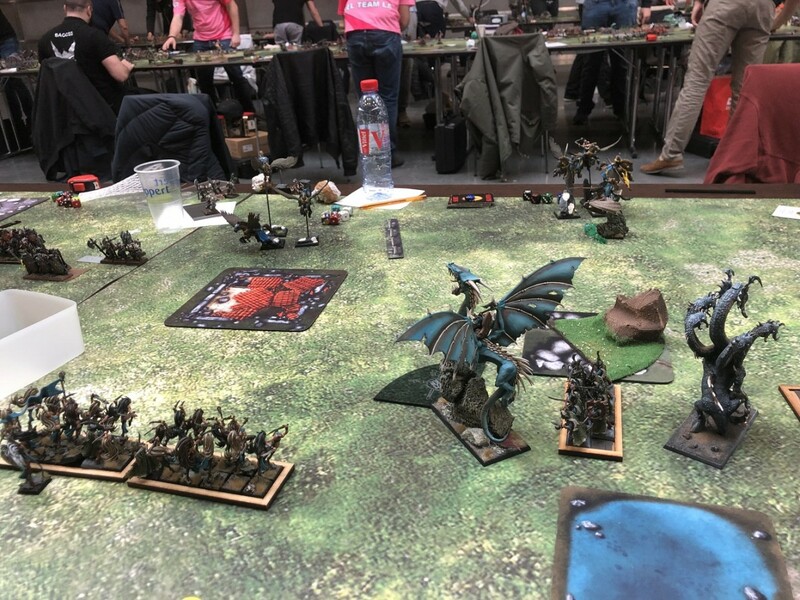 The Grave Calls was then cast on the middle Pegasus Knights: I got 8 wounds at AP3, but my opponent managed to save all of them with is 5+/5++! The Realm Knights charged the medusa right in front of them, and the Duke redirected into the Dark Raiders. The Questing knights also fell upon them. In remaining moves, the Pegasus knights in the middle flew over the prince and landed in a position where they’d be able to charge him if he rallied on the following turn. A unit of yeomen stepped right in front of my kraken, blocking any charges I might have had against the Duke on the following turn. With the damsel in combat, the only spells cast were the Divination buffs on the Questing Knights. In combat, the Duke and Questing Knights wiped out the Raiders with ease, and the Realm Knights did the same with the blocking medusa. The entire KoE battleline remained tightly packed, not giving me any easy pickings. 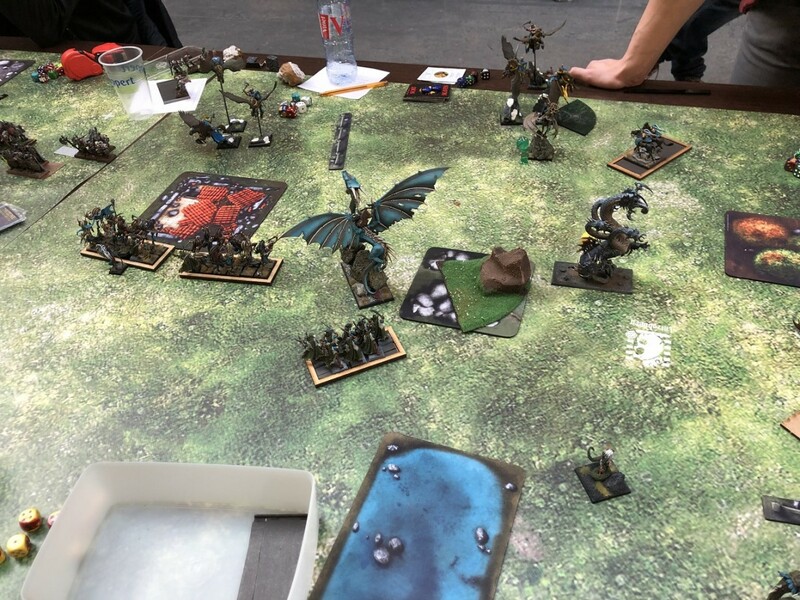 The whole prince debacle had put me in a tight spot, so I tried to counterattack and put some pressure on the KoE: the Acolytes spotted a mistake in my opponent’s reform and charged the Realm Knights carrying the Damsel. The way they were positioned, I would be able to avoid any countercharges for at least a turn, meaning that I’d have 3 combat phases to try and break them, including potential support charges. So they went in, and the Dark Raider unit scaled the hill and prepared for a flank charge on the following turn. The Kraken took the Yeomen bet, forcing a terror check that was easily passed. The Prince rallied and reformed to stare at the Pegasus knights next to him. The Yema Acolytes moved up to support him, while on the other side of the board the scorers moved some more, always with the manticore in close support. 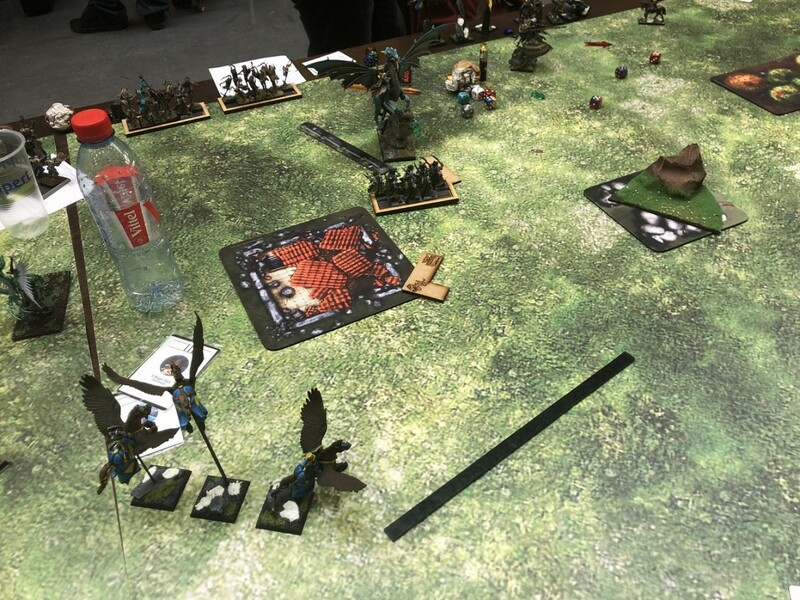 Combat was a similar disaster: the charging Acolytes only managed a wound on the Realm Knights and took a single casualty back, losing the fight by 1: I failed my break test and was forced to flee. This left the realm knights free to reform and charge my Dark Raiders on the following turn. 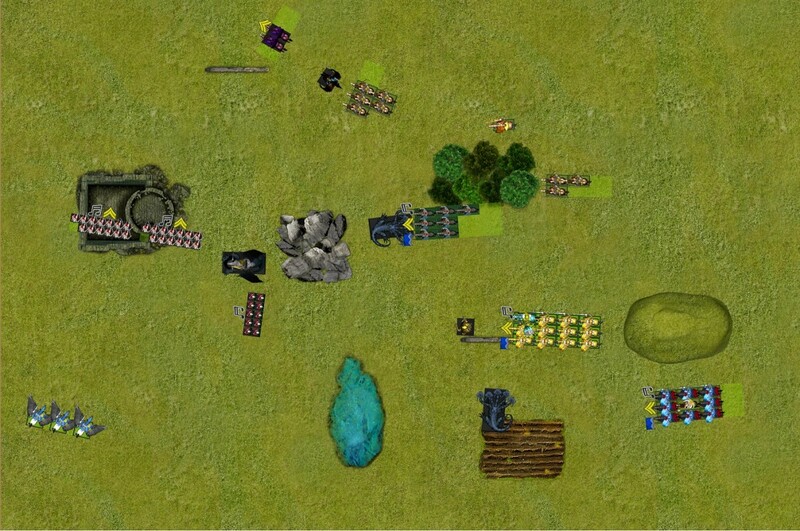 The kraken killed a couple of yeomenand forced the rest to flee, somewhat blocking the questing knights right behind. So my plan had backfired, and the kingdom now had several charges to declare: The Realm Knights charged into the Dark Raiders, and rather than give them a free reform inside my deployment zone I opted to stand. 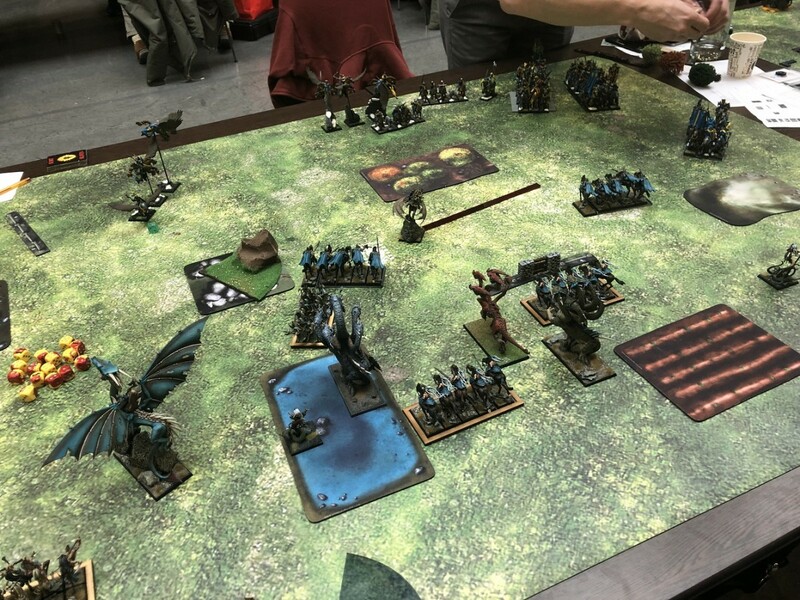 The Questing Knights charged my fleeing Acolytes and caught them in pursuit, the Pegasus Knights charged my Prince and the Duke plus Aspirants combo-charged into a 390-point bait called a Kraken.. 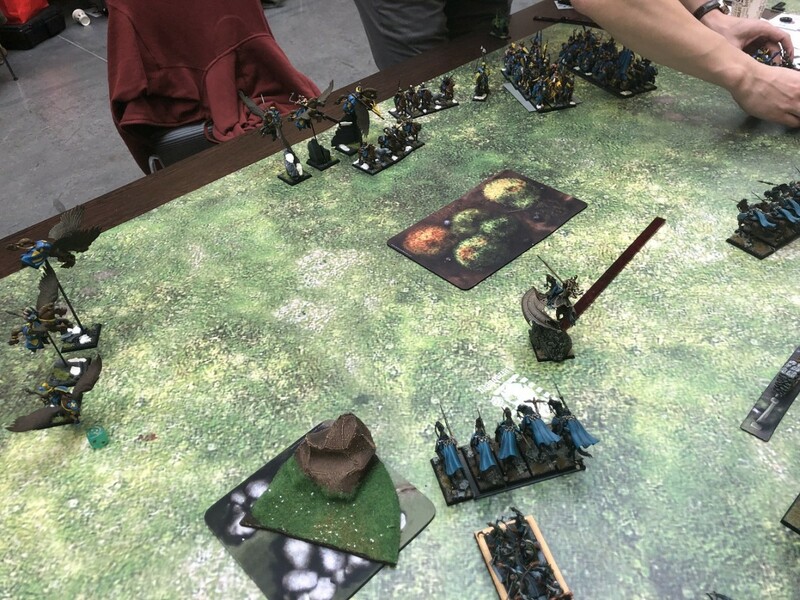 The fleeing yeomen rallied, and the Green Knight moved up to redirect the bottom Kraken that was staring at the duke’s flank. Magic was uneventful, the only buffs cast were on units that didn’t really matter. In combat the Duke and Aspirants instantly killed the kraken, and the Aspirants overran towards the second one. A short overrun would allow me to charge past them and into the Duke, which was the point of the kraken bait all along: they rolled an 11 and stopped a couple of inches away from my monster, effectively blocking it. Next up, my Prince attacked the two charging Pegasus knights and managed to kill one with his attacks! The remaining knight wounded my Prince once, but I succeeded my 4+ save and stayed alive! The knight passed his break test and stuck in combat. The Yema Acolytes charged into the pegasus’ flank, to make sure that the Prince would be free on the following turn (the duke was dangerously close once more). The Krakens, for lack of a better target, charged whatever was in front of them: one fell into the Aspirants and the other into the Green Knight. Finally, the fleeing Dark Raider rallied. The only redirector I had left was the Medusa, and she stepped right in front of the Questing Knights to make sure that they wouldn’t be able to threaten either of my kraken for at least a turn. 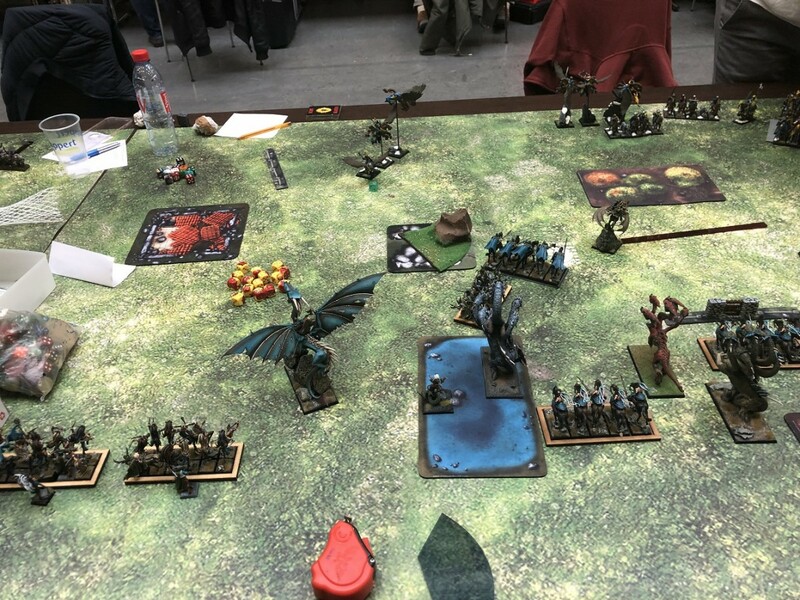 On the far left, the scorers moved past the Pegasus Knights, showing their rear to them; my reasoning was that due to the DTs from the Ruins I’d be able to hold for at least a turn, allowing my Manticore to come to their aid and rid me of that flying threat. Magic was now easily countered, so we moved directly to close combat. The Prince and Acolytes finished off the Pegasus knights, allowing my general to reform and the acolytes to overrun to safety. The Kraken -aided by the nearby Beastmaster- killed three Aspirants for no wounds back and won combat, but the Aspirants held. 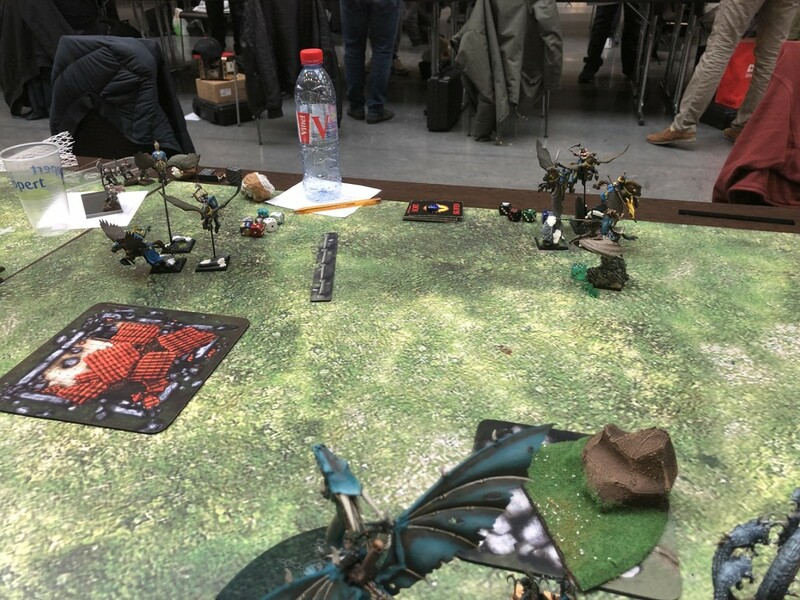 Finally, the Green Knight caused two wounds to the charging Kraken, but then the beast went crazy and dealt three wounds, which proved to be enough to kill the spectral knight instantly! The duke didn’t have any charges this turn, but both Questing Knights and Realm Knights charged the redirectors right in front of them. The big yeoman unit stepped right in front of my Prince, ready to block him when the Storm Clarion was used on the following turn. Magic was focused on the Questing knights since the Aspirants were too far, and the Scrying went through. In combat the Kraken continued to chomp on Aspirants, killing two this time around for no wounds back. They held once more. The Realm Knights killed the final Dark Raider and reformed, but the Questing knights fluffed and only dealt two wounds to the medusa. The Medusa struck at the unit champion and killed him, then fled a convenient 4” staying close enough to the Questing knights to redirect them once more if it rallied! The Storm Clarion grounded my flyers this turn, forcing my Prince to charge the blocking yeomen. The Medusa rallied and the Yema acolytes moved right into the forest to threaten the Duke with magic. Now the Blades could run for the KoE deployment zone, with the Manticore still covering their backs. In magic I started with a Breath of Corruption on my Acolyte champion, which drained all of the dispel dice. Then they cast Grave Calls on the Duke; this time, 7 s6 hits were dealt and the 4+/5++ save of the Equitaine general was not enough to save him: he suffered 3 wounds and died, panicking the Yeomen next to him (They would eventually flee from the battlefield). The Kraken continued crushing Aspirants, now only five remaining. 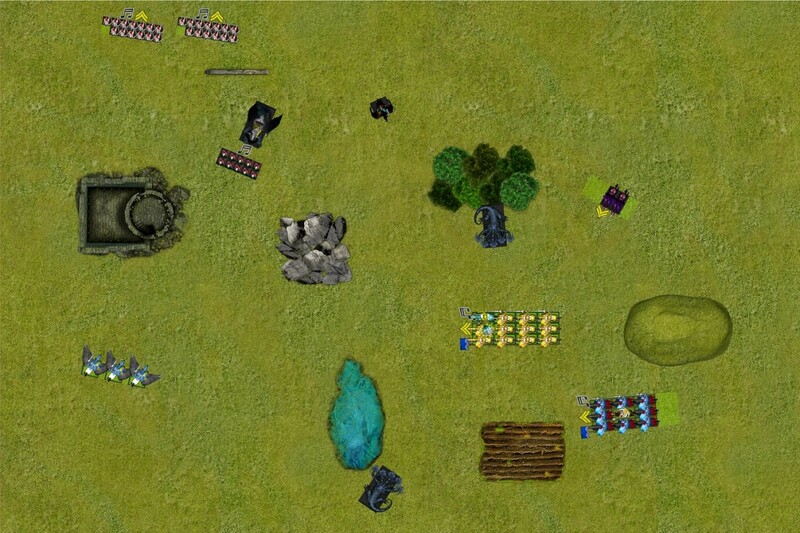 Thanks to the proximity of the BSB they held their ground and continued fighting. The Prince killed four yeomen and the fifth would eventually fail his DT inside the forest and die. So with the Questing Knights blocked and the Duke dealt with, I was now in a far better spot than before! The Questing Knights charged the medusa once more and killed it, while the Realm Knights maneuvered close to my bottom Kraken. 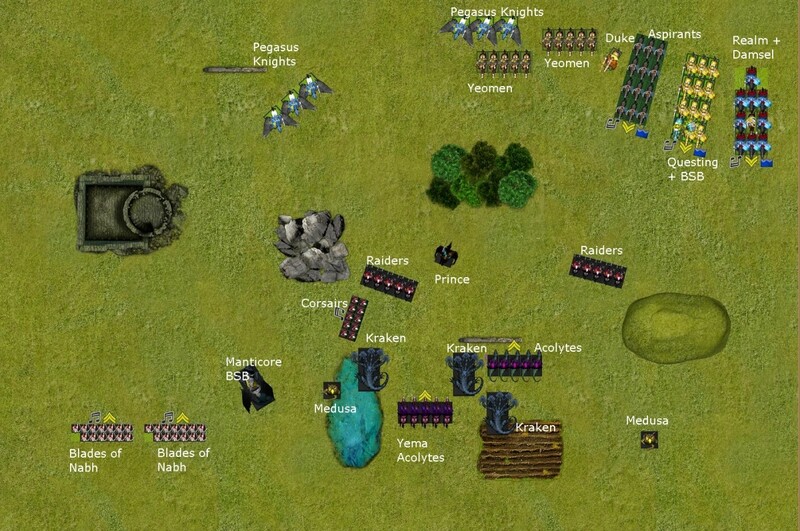 The Pegasus knights moved up a bit to threaten the corsairs who were still not inside the enemy deployment zone. In magic I used all of my dice to stop the Unerring Strike, meaning that the Kraken took a wound from Fate’s judgment. It now had 2 wounds remaining. 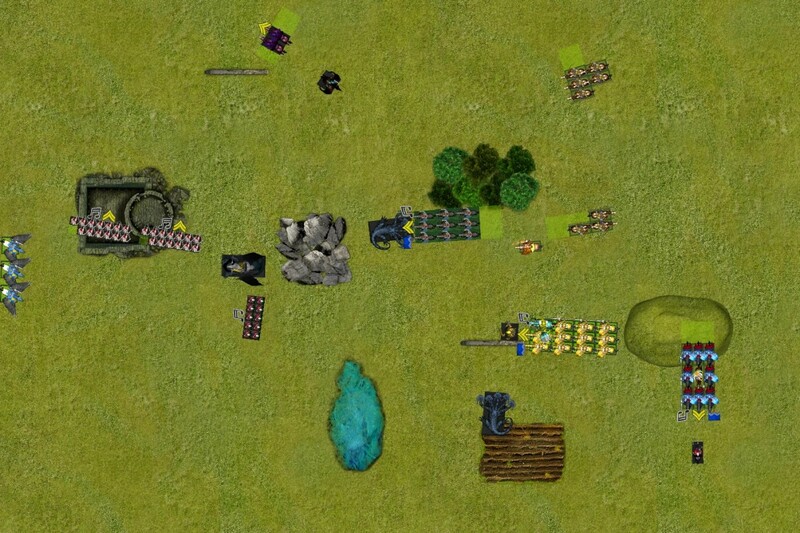 The questing knights finally killed the medusa and reformed to give one kraken a flank charge and the other a front charge if it succeeded in dealing with the aspirants. And it did, killing 3 more and running down the two survivors. Unfortunately, in doing so it ran too far and could no longer charge the questing knights on the following turn. 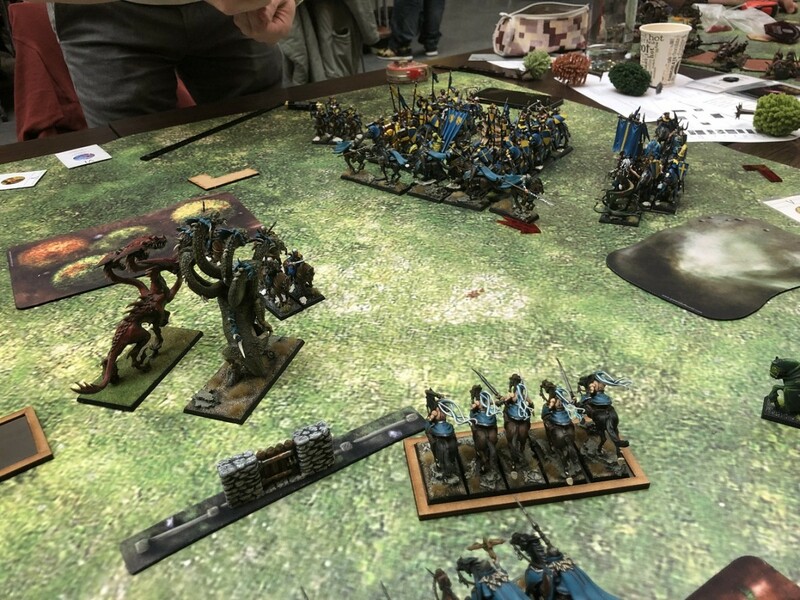 By now I was ahead in points and was also winning the objective, so I saw no reason to risk charging a single wounded kraken into the flank of the questing knights: on a lucky roll the kraken would die and the knights would get to reform and charge again. So I opted for the cautious approach and moved both krakens in positions to threaten the knights on the last turn of the game. The Corsairs moved up some more, ready to enter the KoE deployment zone; the Manticore moved right in front of them, so that if the Pegasus knights charged them the corsairs would get pushed right into the KoE deployment and too far away from the pegasi. My adversary didn’t charge on his last turn, opting instead to magick my wounded kraken to death. On my last turn I got the third scoring unit into the KoE DZ and scored the secondary objective, bringing the game to a close. 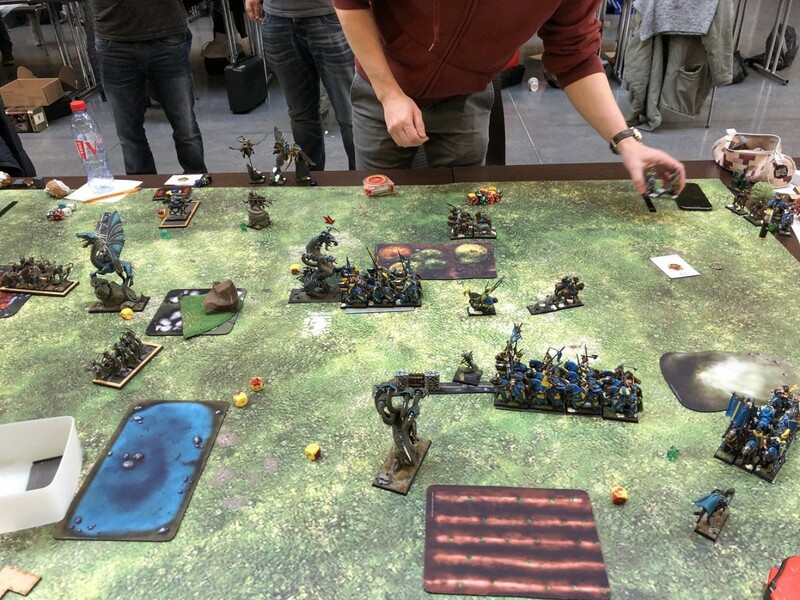 The Dread Elves had managed a 15-5 win, something I was very happy with given how the game had started! The rest of the team got mixed results, and we ended up losing by the smallest of margins: 48-52 for TG Play, in a very exciting round! Our adversaries would go on to get second place overall, a deserved result given the quality of players! This game had so many ups and downs, I hope I was able to convey half of the excitement I got playing it! Xavier played a very tight game and never made any errors that I could really use as a stepping stone, except perhaps that Realm Knight/Acolyte combat that ended up working to his advantage anyway. During the first couple of turns I had several instances of bad luck, and a big error in the Prince’s positioning that could have been avoided just by stating my intention when chaffing the Aspirant/Duke block. But the two turning points were my Prince surviving the Pegasus Knight charge (granted, after he had suffered two very improbable wounds from DT) and the Acolytes killing the Duke in one go. The thing I’m most happy about is the way the Manticore ensured a scenario win, although it could be argued that it was the KoE’s success that 370 points’ worth of Pegasus knights kept one of my hard hitters occupied all game long. I’d still say that the 6 point scenario swing was worth it. In terms of approaching the game, I am now certain that rushing into the fight would have resulted in a big loss for me: as long as the Duke is free to countercharge I cannot commit. My opponent cleverly kept the Duke out of the units during deployment, making sure that I wouldn’t be able to just pin the lance containing him. Better use of my Pegasus prince would have probably allowed me to play more aggressively, although the Storm Clarion greatly limits the options for the two characters. Overall, this was probably the most challenging game of the weekend, against a great opponent! After that round, we were still at the top spot, and would be playing our last game against team Autoroots for the 1st place of the tournament. Stay tuned, the last game will be up soon! I think you made a rules mistake: the medusa is supernal. When she lost combat she should have died from crumble instead of fleeing. Or do I understand something wrong? Other than that, thanks for the report, a wonderful game and write-up as usual! Wow, you're absolutely right! I failed to notice how supernal changed from being just another way to say Fearless to being unstable + magical attacks + fearless. This would have had, potentially, quite an impact on the game, forcing me to commit the bottom Kraken to the Questing Fight in order to keep the Aspirant combat going. If KoE played a tight game, without significant errors, but still ended in 5-15, was it just bad luck/not enough praying? Do you think he could have won if he did anything differently? I think it is a very dice-dependent matchup for both parties; if you commit and your forces get stuck or fail the charges, you're in for a very nasty surprise. The fact that my opponent chose to forego one flank meant that he abandoned the option of winning the objective, essentially. So it was always going to be a draw-ish game thanks to that. Given that Breakthrough is one of the best scenarios for KoE, I think that he could have tried a more central deployment so as to be able to counter my scorers and win the secondary. After the game he mentioned that he felt it was greedy of him to try and kill the Pegasus Prince with the peg knights, and that he should have instead gone for the Yema Acolytes. I think it was a calculated risk with a potentially high reward, but it definitely cost him. Amazing report! I enjoyed it very much. Thank you and keep doing that. What a brilliant recovery. I was not expecting that! The play with the Manticore was masterful - I am taking notes!